In this photo, from 2015 Joe Main, third from left, Assistant Secretary of Labor for Mine Safety and Health, and Patricia Silvey, center, Deputy Assistant Secretary for Operations with MSHA, speak with workers at the Gibson North mine, in Princeton, Ind. 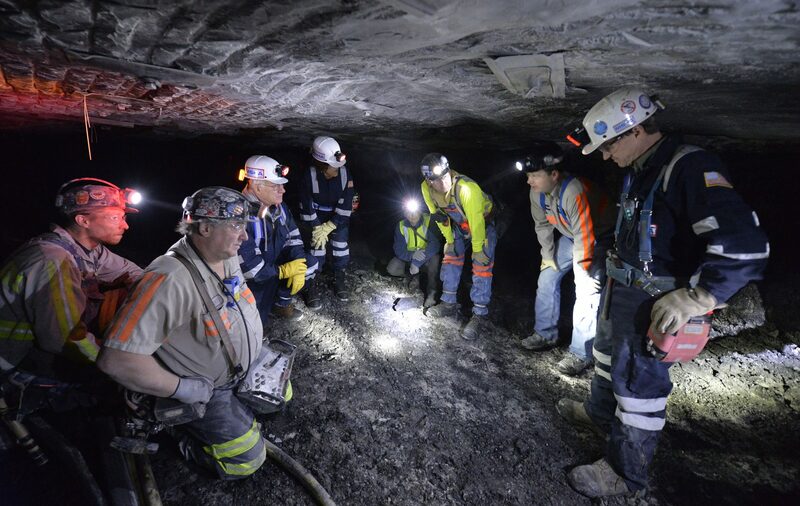 Federal mining regulators in December 2017 indicated they were reconsidering rules meant to protect underground miners from breathing coal and rock dust - the cause of black lung - and diesel exhaust, which can cause cancer. In December, an NPR and Frontline investigation revealed that regulators didn’t act when they could have stopped the exposure of thousands of coal miners to toxic dust. Now, NPR reporter Howard Berkes and a team discovered, there’s an epidemic of black lung disease caused by that dust. The disease is fatal. Bernard Carlson, who worked in mines in Somerset and Westmoreland counties in western Pennsylvania, has it. Berkes and his team found Carlson and other miners after their research on advanced black lung disease cases led to a simple question. In the latest episode of StateImpact Pennsylvania’s ‘energy, explained’ podcast, Berkes talks with StateImpact’s Reid Frazier about the story, and how miners like Carlson reflect on how practices in coal mines caused them to contract this deadly form of black lung disease.